There are many types of disc injuries (bulges, herniations, ruptures, degenerated) as well as different names for the same things (slipped or protruded for bulged). Basically, they're named for the degree of injury to the disc, from the least (bulges) to the most (ruptured). 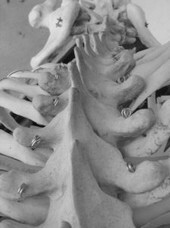 The disc sits between a pair of vertebrae. The disc consists of 2 parts, a nucleus and annular fibers. The nucleus is like a balloon filled with a compressible gel. When you put weight on your spine, the gel is compressed, thereby absorbing the weight and preventing one vertebrae from crushing the vertebrae below it. When the gel is compressed, it expands in all directions. The annular fibers are anchored into the vertebrae above and below and surround the gel thereby limiting that expansion. That's important because if the gel expands too far, it will pinch the nerve that comes out between the vertebrae. When the annular fibers are torn (generally from excessive bending, twisting and lifting motions), the gel "bulges" through those weak torn fibers and can pinch the nerve. The torn annular fibers are also very pain sensitive themselves. The bigger the bulge, the more likely the nerve will be "pinched" causing pain. A herniation is when the fibers are torn so much that they can't contain the nucleus (gel). It breaks through and "pinches" the nerve. A rupture is when the gel breaks through the fibers and a piece of disc actually breaks off and "pinches" the nerve. A degenerated disc is a disc that has lost gel as well as strength of the annular fibers allowing it to bulge out in all directions. It is generally the result of repetitive injuries to the annular fibers. Severe degenerative discs can result in "bone on bone", leading to arthritis and bone spurs which can "pinch" the nerve. Bulged (protruded) and herniated (sequestered) discs respond well to various chiropractic techniques including Flexion/Distraction, manipulation and mobilization. Disc Ruptures can be more difficult to treat and have a greater risk of requiring surgery. Discs, like ligament sprains, also do not have a direct blood supply and therefore, heal slowly.